This city was later on leased to Chikkadevaraya, who was the King of Mysore in the Seventeenth Century. He expanded this fort and built the Sri VenkataRamana Temple within its boundary. Generally, a Fort is situated in the center of cities with fortified walls and impenetrable obstruction all around it (like water with crocodiles/ thick Cactus bushes, etc). Inhabitants of the city live around the fort surrounded with a wider fortification, as an outer perimeter of the fort. During war, people can hide inside the fort while the army defends the fort from within the boundary. The famous Mysore King Hyder Ali secured Bangalore as Jagir in 1758. He built a Stronger Fort (in stone) and strengthened the existing fort. 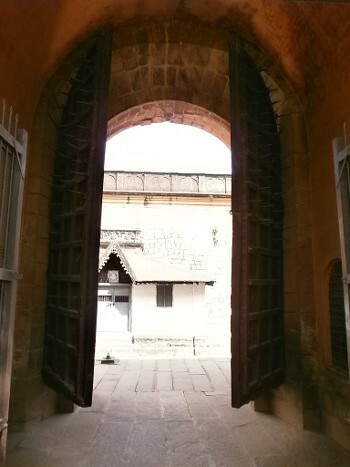 After him, the Fort was taken over by his son Tippu Sultan, in whose name the Fort is sometimes called even today (Tippu Sultan Fort). 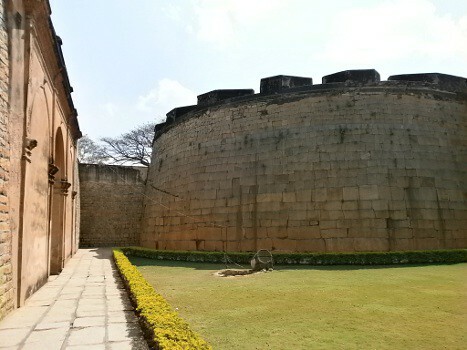 It seems Cornwallis (decorative terms like ‘Lord’ will be deliberately missed) captured this fort, but handed it back to Tippu Sultan as a part of the Srirangapattana Treaty. Originally, the Fort had a perimeter of over one mile and had twenty six watch towers along the perimeter. This Fort was thereafter in ruins as recorded in Mid – 19th Century, but a small portion of it (Delhi Gate) has survived to this day, and is being maintained as a protected monument by the Government. 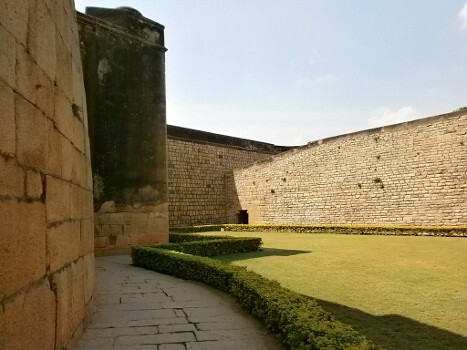 Anyone can visit the Bangalore Fort and there is no entry fees. I had visited this fort long long back and don’t remember much too. It looks quite good even after so many years. 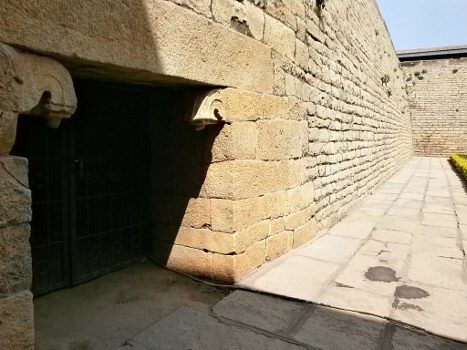 It is being neatly maintained, but only a small portion of the Fort is open for public viewing! There is a Mosque near this Fort (across the flyover), which has an awesome construction. That is must-see, as well. 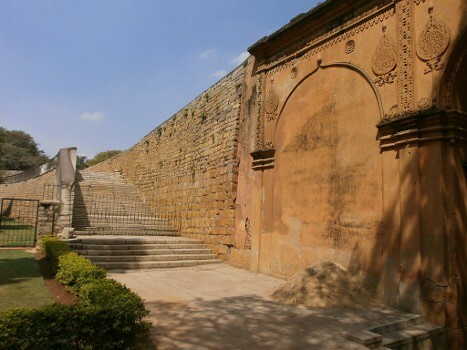 I never knew that there’s a Bangalore fort that existed within the city…The fort looks really impressive. And LoL at deliberately missing Lord – I like it…not everyone deserves that! And a nice write up as usual – unveiling the history details to us DI! I feel that no one deserves to be “Lord”, except perhaps the real Lord. Well maintained site which we hardly find these days.People write all sort of things on the walls.This place is free of those writings. There is a huge notice mentioning that there will be a fine applicable for damaging the property in any way. And there was a person who was maintaining the place and keeping vigil. Its stick that works! havent seen this one. mysore king?? or srirangapatnam?